This cancer detecting sensor is 1 million times more sensitive than previous versions. Using “nanostructured metamaterials,” a team at Case Western Reserve University has created an optical sensor for cancer detection that is 1 million times more sensitive than previous versions, and it can fit in the palm of your hand. The device can single out one lightweight molecule in a solution, which is at the heart of the new instrument’s potential—it will allow doctors and oncologists to detect even a single enzyme of a cancer cell floating around in the bloodstream. Which means earlier detection, and that means more lives saved. The key is isolating proteins of a low molecular weight, less than 500 Daltons, which are what early tumor cells frequently produce; the new instrument can detect proteins of only 244 Daltons. And the technology can even be extended for other medical applications as well. The new biosensor uses a suite of nanomaterials to essentially sieve tiny proteins from a dilute solution. The problems the team needed to overcome in its design was the inability of light to register objects smaller than its wavelength, and the Brownian motion of molecules in a solution, which prevents the proteins from actually settling into the sensor. The first problem was surmounted by developing a nano-scale “metamaterial” that could concentrate, reflect, and amplify light waves; the material is structured in such a way that the presence of tiny molecules on the sensor is betrayed in the reflected light signature. 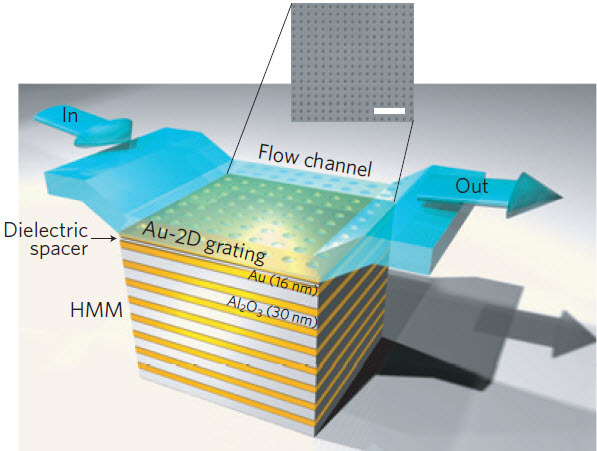 The second problem was overcome by using microfluidic channels to force the molecules onto the sensing surface. In experiments, the team was able to use the sensor to identify biotin, a biomolecule with a molecular weight of only 244 Daltons, well within the threshold of early cancer enzymes. “This new sensing technology may help us not only detect cancers, but what subset of cancer, what’s driving its growth and spread and what it’s sensitive to,” says Nima Sharifi, a doctor at the Case Comprehensive Cancer Center, who has begun using the sensor to detect proteins for prostate cancers. The next step is to get the sensor into the hands of oncologists worldwide, to test it, refine it, and move it toward regular, clinical use.